City Council intends to request the removal of the residential development prohibition in the Airport Vicinity Protection Area (AVPA) currently impacting certain properties in Inglewood. 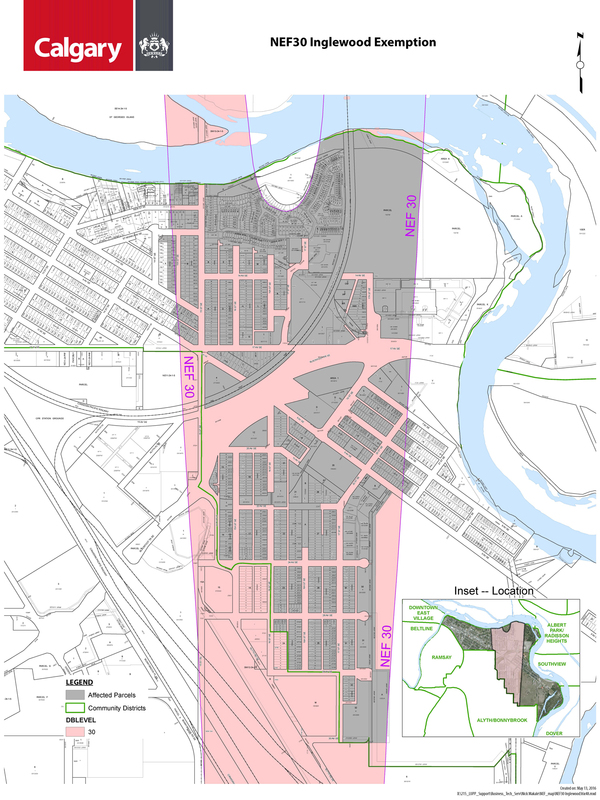 City Council is requesting that the Minister of Municipal Affairs remove the residential development prohibition in the AVPA currently impacting properties in the Inglewood community located within the Noise Exposure Forecast (NEF) 30 contour. This exemption may allow existing residential properties to increase their development/redevelopment potential in accordance with the provisions of the Calgary Land Use Bylaw. What is the Airport Vicinity Protection Area Regulation (AVPA)? What is a Noise Exposure Forecast (NEF)? How does the AVPA affect my property? How will this exemption affect my property? The Alberta Government enacted the AVPA in 1979 to govern land use development near the Calgary International Airport and to ensure that only compatible land uses are developed that will not interfere with the operations of the airport, including its runway arrivals and departures. This regulation establishes allowable uses in certain locations, identified as Noise Exposure Forecast (NEF) areas, due to potential noise impacts from aircraft flying over the community as they arrive at or depart from the Calgary International Airport. As a result, some types of residential developments are not allowed within certain NEF areas; however, existing residential developments have been allowed to remain in these areas and can be rebuilt if they’ve been demolished or destroyed. In 2009, the AVPA was reviewed by the province and changes were made. Some of these changes included new definitions of what a residence was and also clarifications regarding reconstruction and replacement of existing residential units. In Canada, noise around airports is calculated and identified through a Noise Exposure Forecast (NEF) established by Transport Canada. The NEF is a standardized format, and computer modeled determination, of expected noise levels in areas within the vicinity of an airport. It predicts likely annoyances from aircraft on a community, by considering factors such as types of aircraft, flight times, arrivals, departures, and future runway expansions. Anticipated noise levels are described as contours on a map (i.e. Noise Contour Map) with an assigned NEF value for each contour. Transport Canada recommends that noise sensitive developments be controlled from the NEF 25 contour level and greater with specific restrictions for residential land uses at the NEF 30 level or greater. a new secondary suite cannot be developed. Please Note: These prohibitions apply even if the Calgary Land Use Bylaw shows your property is located in a land use district which would allow for increased residential development. Subject to the provisions of Calgary Land Use Bylaw 1P2007, property owners may be able to develop a secondary suite or subdivide their lots to add an additional residence or construct new residential buildings, including multi-unit residential buildings. Any new development would still be subject to the acoustical requirements set out in the Alberta Building Code at the time a development permit relating to a new building is issued. Thank you to everyone who provided feedback. The opportunity to provide input is now closed. The feedback collected will help inform and shape the report presented to Council on the AVPA exemption. This What We Heard report compiles the feedback from the AVPA exemption open houses and online survey. Thank you to everyone who provided input! Provide feedback on this page until September 13, 2016. Description: Join us to learn more about the AVPA exemption and provide feedback for Council consideration on the matter. Are you in favour of the amendment or opposed to the amendment?